Hurrah it's Friday and time for the Tube Fashion Victims or the TFV's, travellers on the London Underground who have "taken a style and made it their own" (to quote Louis Walsh out of X Factor) or have decided to go all out for "fashion for fashion's sake" and have the fashion police come rushing to their door. However, this week I want to start with two poster campaigns for fashion brands which use the London Underground as part of the backdrop. 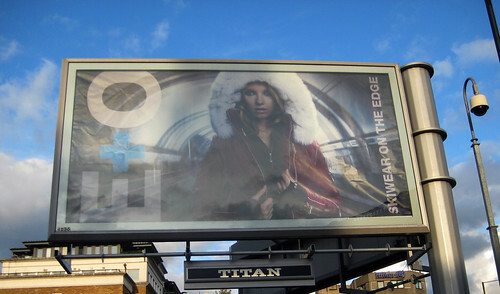 Mainly because most advertisers think the Tube equals London, trendiness, edginess & uber coolness. Last time I featured a picture of Kate Moss peeking out from beneath old ads on the Tube and the shop she designs for - Top Shop have grabbed some models & got them to look all sulky in Tube carriages for their poster campaign. 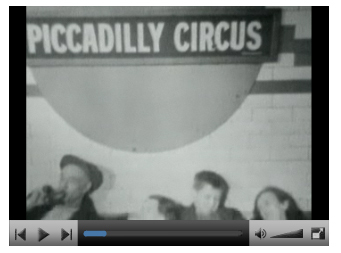 You might want to have a guess at where the poster above was shot, as that moquette or Tube upholstery looks quite old. 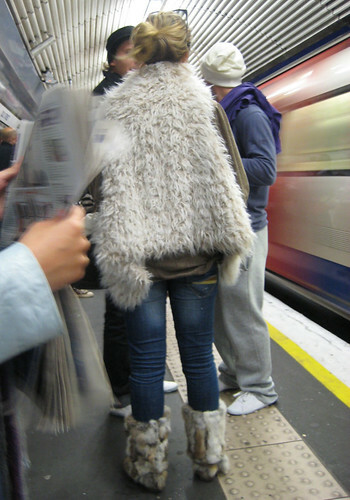 Apparently it's edgy to stand in the middle of the lines at Caledonian Road Tube station, wearing your ski gear. Now onto the TFV's - although I'm starting with a RFV or a Railway Fashion Victim. I know it's the time of year where people do a lot of dressing up, but I spotted this guy at about 8.30am, which is a little early for fancy dress. You don't often see pirates on your morning commute. Or maybe he was a highwayman. Either way I was lucky not to stand behind him on the train as that feather would have tickled my nose. BTW speaking of dressing up for parties - Alfie spotted some pictures from a recent Tube Fancy Dress party on Moblog - with High Barnet & Green Park very well represented. If you're looking ideas for London Underground Fancy Dress party for Xmas there's a fair few in the comments on an old post of mine. 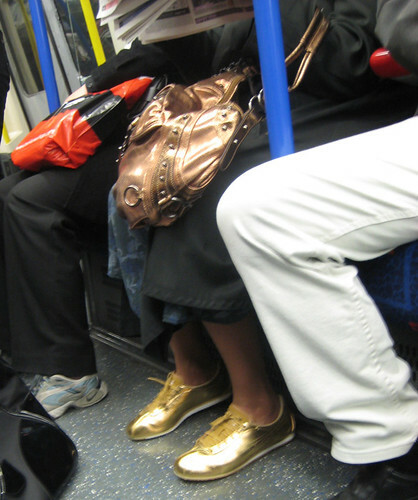 Spurred on by my spot of some dazzling gold shoes last time, Pete from the Londoneer spotted some more gold footwear. He said "My eyes nearly popped out when I saw them". But like me, he thought that the pink shoelaces with them, really err ... set them off! 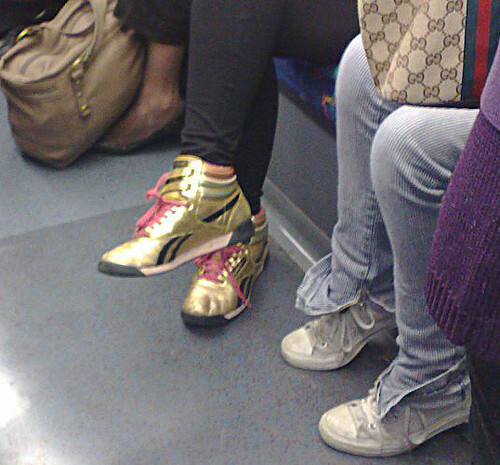 The woman sitting next to gold shoe woman with the Gucci bag, also has an interesting take with their zipped jeans. I'm sure it's just me, but wouldn't you just buy a shorter pair of jeans if you were going to have them with zips at the bottom? Or perhaps the point is to have that messy "I'm too cool to care" scruffy turned up look. I seriously thought the guy with the blue T-shirt was going to expose all of his paisley pink underpants, but even he had the sense to try to pull down his T-shirt a bit as he approached the stairs & escalators. Until next time, the previous fashion victim post is here and the complete picture gallery of all the TFV's can be seen on the following Flickr set. If you're a Londoner but have been living on Mars for the past couple of days, you might have missed the news that Westfield Shopping Centre finally opened today. Over the last few weeks I'd already blogged about all the new London Underground stations (Wood Lane & Shepherd's Bush stations), and transport links set up to support the masses of people who'll be heading over to Shepherd's Bush / White City for a shopping extravaganza at Europe's largest new shopping centre. However, the transport system had some technical hitches this week. 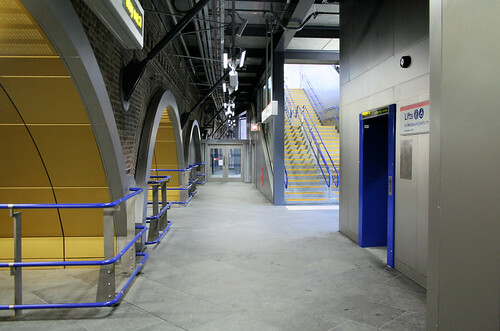 Safety technology and a lift were not working at Wood Lane Tube station today, and one of the new 3 million quid escalators at the new Shepherd's Bush station broke down on Monday. Meanwhile over on the Hammersmith & City Line, the screens which show drivers when it's safe to shut the doors aren't working at Wood Lane station. 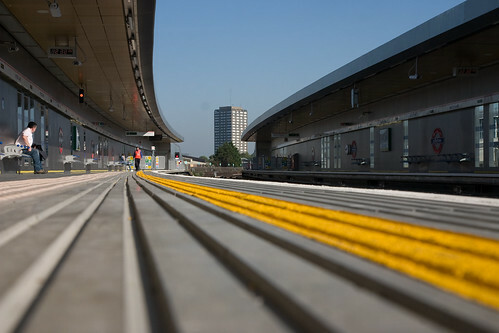 The Evening Standard earlier reported that "The current problems come after the opening of the new Shepherd's Bush overground station had to be delayed because the platforms were 18 inches too narrow. 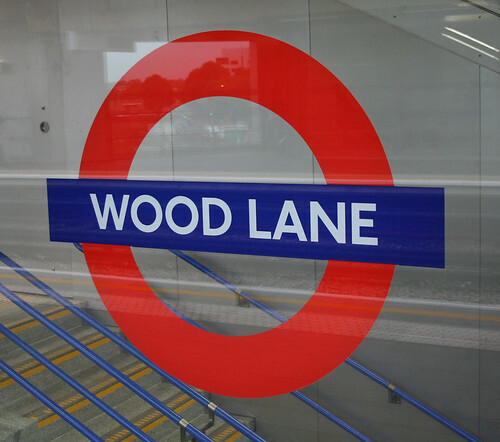 A TfL spokeswoman dismissed the problems, saying: "Three of the lifts at Wood Lane Tube station have been commissioned and provide enough capacity to meet passenger demand. The fourth lift is waiting for a part." She said that platform screens would be working "shortly". TfL insisted the two escalators at Shepherd's Bush would cope. 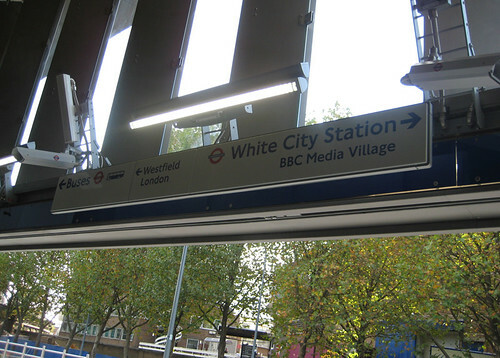 The broken escalator was "swiftly repaired" and the station remained open, the spokeswoman added. Hammersmith & Fulham council leader Stephen Greenhalgh said: "We intend to hold TfL to its promise of providing step-free access. We will not let this matter rest." Let's hope that TfL can keep up. I love shopping and can shop till I drop, but like Debbie Davies, I was somewhat bemused to see the rather err... worshipful advert for Westfield Shopping Centre's opening. I couldn't have put it better than Debbie who said "Oh get over yourself! It's a glorified shopping mall, not a cure for cancer." It's been a while since I've written a post on London Underground roundels that you've found on your travels that are not in their natural Tube habitat. She said: "I snapped this on my way to work one morning. I have no idea what it means, but this was stuck to a road sign indicating the diversion away from Brick Lane (it's currently closed for East London line work but I continually see GPS idiots go up there anyway, and I laugh)." If anyone has any idea, it would be appreciated! 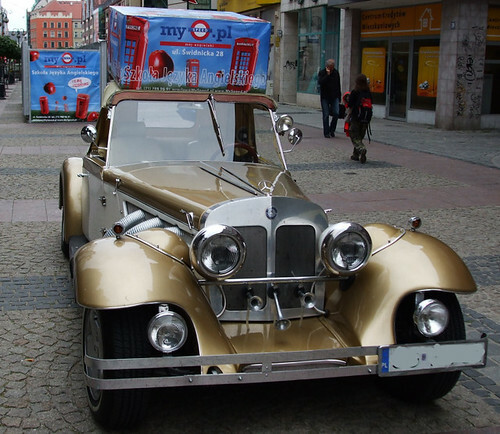 Going a bit further afield now, Pete from the Londoneer spotted this in Poland. He said: "Here's a roundel I saw one weekend while I was in Wroclaw (pronounced Vrots-waff) in Poland - cheeky or what! I think it's offering an internet service...". Finally some sporting roundels. 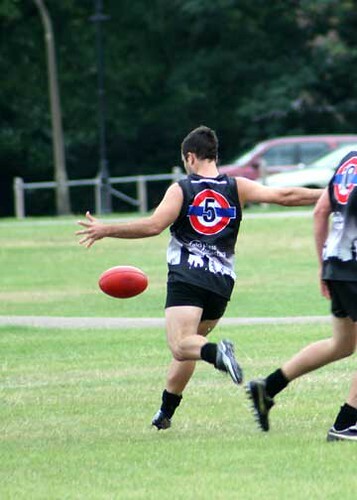 The strapping lads below are from the Putney Magpies, a team in the British Australian Rules Football League or BARFL. Before TfL's solicitors go racing across to Putney to rip the shirts off these guys, I'm told by Peter O'Neill who sent them to me, that there were a number of complaints by opposing team members & referees, saying it was too hard to see the players' numbers against the roundels, so they no longer use these shirts. Thanks to you all for sending the photos in. The full set of Roundels Not on the London Underground can be seen here. If you spot any more roundels in unusual places please email them to me and I'll put the best up on the next post I do on this. Last night I was lucky to go along to a talk by Abram Games daughter - Naomi, on her father's life and his prolific work in graphic design. Even though I had seen lots of Games work around, I never knew he was the man behind the striking work such as the BBC's first animated logo, the Queen's Award emblem (he didn't like to call them logos), Penguin's first colour book covers from the 1950's and of course some amazing posters for the London Underground and London Transport. 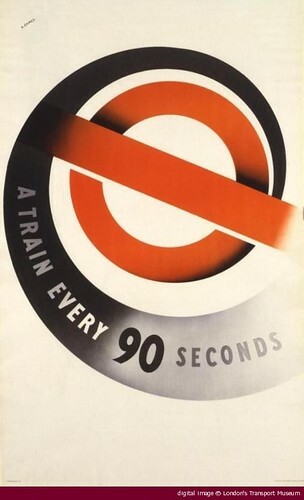 Games was trying to sell most of his works in the 1930's and he was continually told that it was "too modern", so hats off to London Transport who commissioned his first commercial poster - A Train every 90 seconds - and yes, he was well aware of the irony! His school report said that he was "Lazy, careless & untidy and drawing was weak", fortunately he saw this as a challenge rather than a put down. However, he never really got on with formal artistic training and only spent two terms at Central St Martins College before dropping out. He owed a lot of his success to travelling on the top of double decker buses in London and said he should have paid rent to London Transport. From the top of buses he got a great sense for how posters were seen by a lot of travellers. Fleeting glances from strange angles, so the message had to get across quickly. 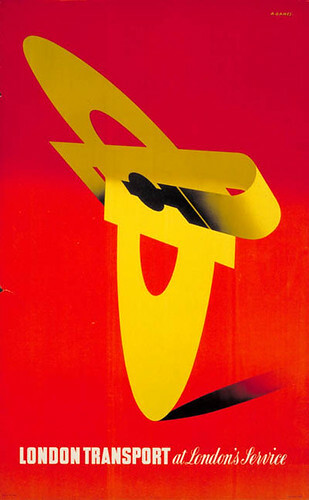 His motto was "Maximum Meaning, Minimum Means", and he used limited colours & limted typography but to striking effect. He left his students at the Royal Academy of Art with three C's that they should apply to their work. Curiosity, Courage and Concentration. Sound advice for most work actually. Naomi's book Poster Journeys: Abram Games and London Transport launched yesterday and contains all of Games work for London Transport with some fascinating sketches which led to all of the posters. Thanks again to London Transport Museum for inviting me and also for having the courage to commission a difficult but brilliant artist who was seen by many as ahead of his time. From yesterday you'll be able to pick up a London Underground map with new artwork from Los Angeles artist Pae White. '...fragment of a Magic Carpet, circa 1213' is a section of a Persian rug, made up from the colours of the Tube map. And you've guessed it, the Persian rug means "the flying carpet motif as a suggestion of magical transport". So even if you've not got around to making an Oyster card wand or watch, and waving it with the command Open Sesame when you get to the barriers, you can still get a sense of the Arabian Nights. 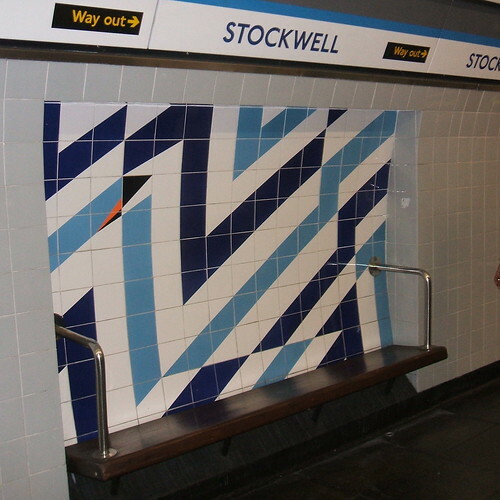 White said: 'The work plays on the idea of networks, storytelling and mythology, weaving the colours of the different Underground lines from Harry Beck's iconic Tube map together as a rug. 'Tapestry is considered to be one of the highest forms of art in the Middle East and by taking this form, the work is a small tribute to cultural integration. 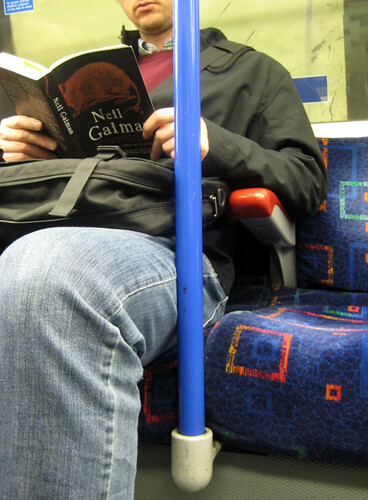 I would love to have a magic carpet and would use it instead of the Tube any day. 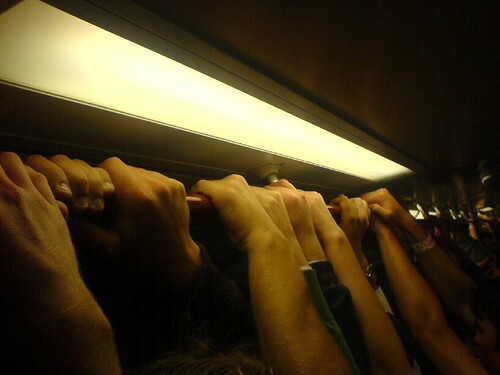 Although I would miss the magic of seeing how many people can squeeze themselves into a tiny space, fit for about half the amount that get inside a carriage. Or the magical way that the District Line is slowly transforming itself into the Northern Line in a bid to becoming the worst line on the Tube. Any other magical Tube sightings or experiences to complement the new Tube map design are more than welcome. Apparently, Abram Games was one of the 20th century's most innovative and important graphic designers. He produced a number of striking posters for the London Underground and tomorrow evening his daughter, Naomi, will be talking about his work at the London Transport Museum. Naomi is also a graphic designer and the event marks the launch of her new book Poster Journeys: Abram Games and London Transport and is supported by a small exhibition of original Games posters from the last 40 years. The event runs from 6.30pm to 7.30pm & tickets can be pre booked on 020 7565 7298 and cost £8.00 adults; £6.00 concessions; £4.00 student. However, I've managed to get a couple of tickets to go along. If you'd like to come with me, send an email to themole AT goingunderground.net or DM me on Twitter. As usual first come first served. Looks like Games had a slightly more efficient service to work with if his A Train Every 90 seconds poster, is anything to go by. I hear that King's Cross Tube station was a tad overcrowded this morning and was closed for a while. So well done if you managed to avoid that. In August we learnt that TfL will be terminating their £100m annual contract with Oyster. Thanks to Alex Gollner, I learnt that mobile phones and bank card payments are being considered as replacements for the Oyster card. Judge said TfL wants the new ticketing system to be contactless and fast, and suggested it could be delivered through another smartcard or on a phone or bankcard. He said it wanted to take advantage of good practice elsewhere. Judge also told the committee that the replacement for the contract with TranSys is unlikely to take the same shape. It could be broken up into a number of segments, each let individually rather than under a large private finance initiative as in the existing arrangements." They're hedging their bets with this statement and covering a load of bases, so personally I'm not holding my breath or getting excited or worried about the prospect of paying my London Underground fares with a mobile phone. By 2010 anything could happen & the Japanese will have probably invented something amazing like paying for your subway fares by touching a pad or staring into a screen. Doubtless we'll be many years behind them. Tonight I'm going to see one of my favourite authors Neil Gaiman who amongst other things wrote the fantastic Neverwhere. Regular readers to the blog and even Goingunderground would have heard me rave about Neverwhere in the past. It's a book based on the BBC TV series Gaiman co-wrote with Lenny Henry in the mid nineties. Neil wasn't too pleased with the TV series, but wanted to work on the idea of a parallel London (London Below) which operated underground and was populated by feudal characters some with names based on London Underground stations. There was the Angel Islington, real Barons and Earls at Earl's Court & Barons Court & even a London Below Tube system made up from those "Special" trains with no lighting in them that speed past your stop. Neil was one of the very first famous authors to have his own blog & I still can't get over him being kind enough to be interviewed for One Stop Short of Barking and even blogging about my request for an interview. He said "Congratulations on the book contract! I'll be in touch about the comments or interview, but I put the e-mail up here on the journal as I've been meaning to link to Going Underground for ages, and you plug the site better than I could. 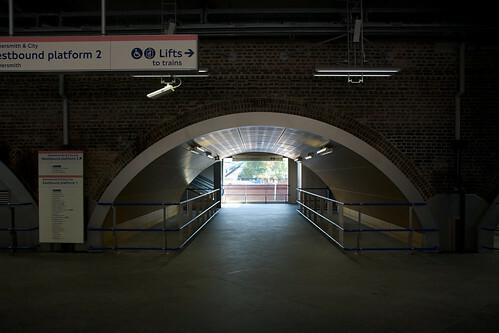 Lovely site filled with odd, London underground things. The weblog is an excellent place to begin -- lots to read. Learn about commuter pigeons, for a start." You seriously don't know what a comment like that from an author like Gaiman means to me. But enough of the Gaiman love, I'm sure lots more will be showered on him tonight. 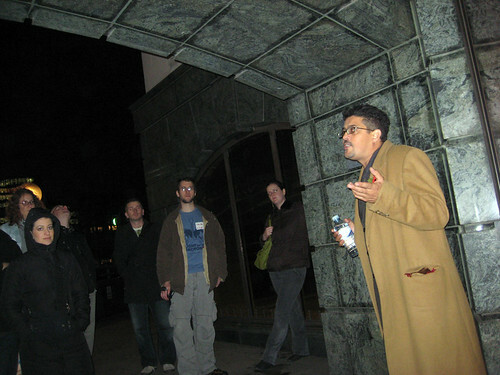 Last night I went on a London Ghost Walk hosted by Qype as an early Halloween treat. 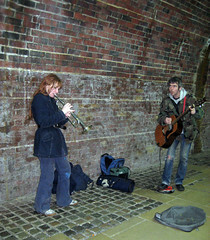 Chris who carried out the walk, was full of amazing stories about hidden London and as we stopped under bridge he started to talk about London's Queen Rats (speaking rats feature heavily in Neverwhere) and Death Line or Raw Meat a 1970's horror film about the London Underground, which also features in One Stop Short of Barking. The premise of Death Line is fantastic and is about a lost troglodyte type underground thing, that lives on humans who missed their last stop on the Tube or somehow got stranded on the Underground. The only human words it has learnt to say are "Mind the Doors". I muttered that this was the worst film about the Tube that I have ever seen in my life. It doesn't even get into the "so bad it's good" realm in my opinion. But each to their own. 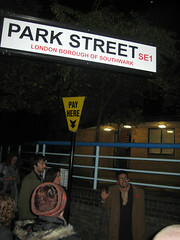 One of the many fascinating things about the London Ghost Walk was hearing about London's Queen Rats. This is an East End legend about a giant rodent that could change itself into a gorgeous woman & seduce dockside workers. Legend has it that if the men satisfied the Queen Rat they'd be blessed with wealth and many children. The first born would be a girl with one grey eye and one blue eye. Chris also publishes a magazine called One Eye Grey! There was a particularly weird moment while Chris was telling this story and we heard a trumpet pumping out the fab lounge musak of Burt Bacharach's Walk on By from some buskers beneath the bridge. Thanks to Qype for hosting a great night which ended up back in the pub with booze and more of Qype's golden food. 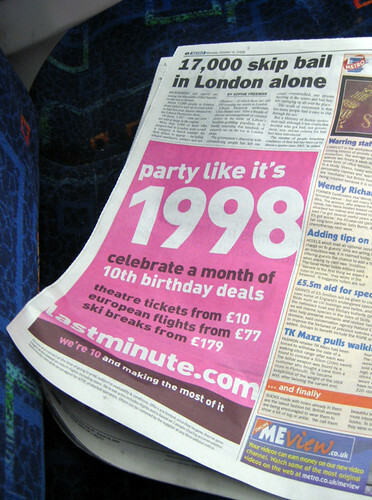 A lot of my favourite websites are having their 10th birthday this year. Even what I nostalgically still call my "main" site the sadly neglected Goingunderground.net will be ten on New Year's Day. A key site for me in those early days (specially for my London on the Cheap page) was Lastminute.com, so I was somewhat shocked & kind of flattered when I heard that they really wanted me to visit their labs & show me some new products they were launching. On Monday evening, fighting the wind, cold, heavy rain & the beginnings of man flu, I grumpily made my way to their offices at St James's Park, thinking this'll better be worth the trip. Thankfully it was. I was introduced to Marko Balabanovic (top name) their Head of Innovation, who showed me a couple of tools that they just launched in beta yesterday. Pronto & Radar. We spent a lot more time talking about Pronto as I'd recently just used Lastminute to book a hotel for a trip to Paris in December & I often book restaurants & theatre tickets online. Basically Pronto makes the search a lot more human, friendly & visual and lets you look for things with out ticking endless boxes. So you can start typing a sentence like "I want to find a Chinese restaurant in Crouch End tonight .." and it cleverly second guesses the things you might be looking for as you type. I asked them how easy it would be to incorporate all London Underground Tube stations into it too. So you could say, I want to find a restaurant near Gloucester Road Tube. Also finding restaurants that had free wifi or reliable wifi would be a god send. Apparently the Tube thing was doable and the wifi, possible depending on the info they had about the restaurants themselves. Anyway, they are really open to people playing around with the tool and making suggestions for improvement, as it's only in beta and they'd love to know what you think. We also discussed stuff like adding more human reviews to their restaurant listings, as if you've booked any hotels with them - you'll know you can see real people's reviews from Tripadvisor next to the hotel. 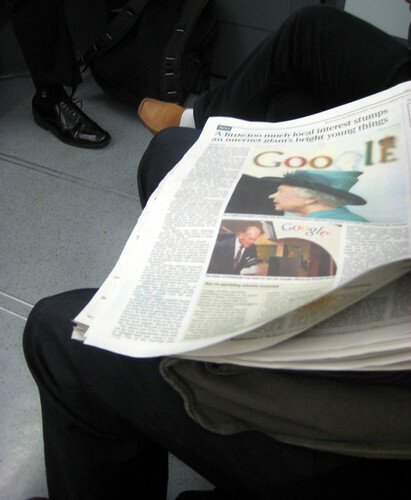 Google also turned 10 this year and last week the Queen visited their London HQ to check out her gmail and have a look at YouTube. Apparently both Queenie and the Duke of Edinburgh are avid internet users who regularly send emails to all their grandchildren. She's got her own Royal Channel on YouTube, (which Google own) that's been viewed 1.6 million times since Xmas. Finally, last night I went along to Fancyapint.com's London Pub Awards. Fancyapint is also about 10 years old & this is the fifth year of the awards. I liked how they ran the visitors awards, as rather than just using pubs that get the most reviews - they also judge on which have the most visits arranged to them through the site. For example they look at things like usage of the "Let's meet here" tool & how many people print off directions or maps to the pub. Fancyapint for as long as I can remember have had a tool where you can find a pub by its proximity to a Tube station and I use that a lot when arranging places to meet. 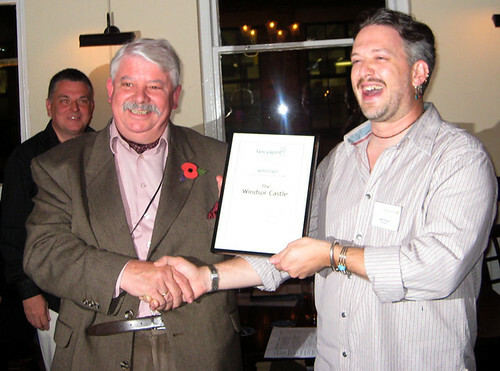 I loved the very British looking landlord of the Windsor Castle pictured above, who was clearly delighted to win a Reviewer Award. He rocked as he had a fab tache, a cravat, a jolly landlord's beer belly AND a monacle. I only hope that we went outside for the odd puff on his pipe. Thanks muchly to TikiChris for taking me along the awards last night. Congrats to all the dot.coms that have managed to survive 10 fooking hard years & the prospect of some rough times in the credit crunch. The good ones certainly look set to survive it & are responding to what their visitors want. Here's to the next ten! Apparently a good way of studying paranoia is to go on a London Underground train and watch how people look at each other. I blogged about Dr Daniel Freeman's paranoia Tube experiment from the Wellcome Trust on April 1st earlier this year and a number of you thought it was April Fool's Joke. 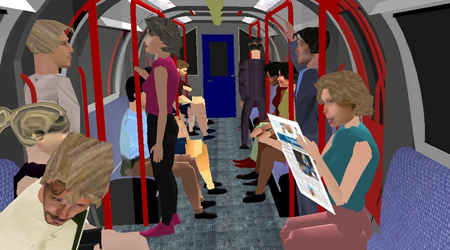 However, The Guardian's Science Weekly podcast tried to re-create his virtual experiment on a Central Line Tube where the reporter describes the way people sit or stand, what they're reading or listening too & how that behaviour can affect other people's levels of paranoia. According to his study one in four of the general public have paranoid thoughts. Freeman said the results suggest that paranoia was a quite normal emotion: "In the past, only those with a severe mental illness were thought to experience paranoid thoughts, but now we know that this is simply not the case." In the middle of the podcast (about 15 mins in) they comment on last week's findings from the London School of Hygiene and Tropical Medicine, which states that commuters have dirty hands. That's no surprise really, but the further North you go, the dirtier people's hands get. The scientists swabbed the hands of 409 people at bus and train stations in five major cities in England and Wales. 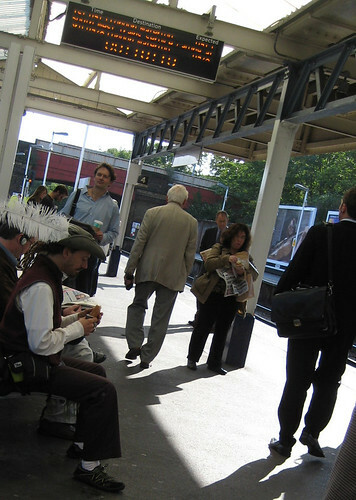 More than one in four commuters had bacteria from faeces on their hands. Men were likelier to have dirtier hands than women except (and I'm ashamed to say this) in London. At Euston station men had contamination levels of 6% whereas women had 21% - urgh. The one good thing for Tube travellers (if anything good comes out of this) is that people who had travelled on the bus had higher rates of hand contamination than commuters who had used the train. The BBC reported: Dr Val Curtis, director of the Hygiene Centre at the London School of Hygiene and Tropical Medicine, said: "We were flabbergasted by the finding that so many people had faecal bugs on their hands. Perhaps we ought to forget being paranoid about how people look at each other on the Tube & spend a bit more time washing our hands, not only after the loo, but before and after commuting. I'm here at the studio of BBC2's Working Lunch doing some live blogging. Which is always a challenge specially as I was half way through a post and the computer froze!!! Such are the everyday trials and tribulations for a blogger - ooops presenter Declan Curry just asked me how things were going and I had to tell him. Anyway in other news Helen Pattinson's company Montezuma's makes tons of chocolate every year, which is music to my ears as last week was National Chocolate Week. I went along to a chocolate tasting with a number of other bloggers to well, err, taste chocolate. However, she lives & breathes chocolate and put her family home up for sale to finance her business, which is a massively brave step - although she said it was "stupid" in hindsight. Declan's asking Helen about that nightmare moment that every person who starts their own business has, when they think, can I actually do this? What am I doing here? Have I made the wrong decision? Thankfully she decided to carry on even though her product is a luxury item at around £2 a bar, so far things seem to be going really well and she's had massive growth of direct sales through the internet. Update - if you're in the UK you can watch this episode of Working Lunch on BBC iPlayer. 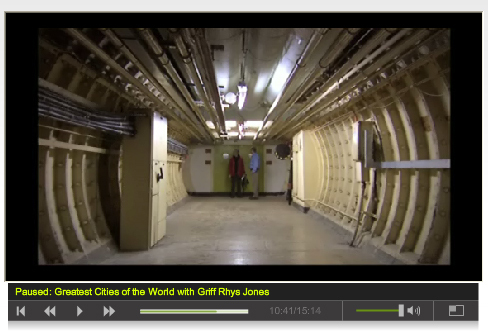 Want to buy some secret Underground Tunnels? Underneath Chancery Lane London Underground station there are more than a mile of underground tunnels that are up for sale. So if like Griff Rhys Jones who explored them, you wanted a quick shortcut to work through the hidden network you'd be laughing. John Pannell & Jon Justice both gave me the heads up to this story which was part of Greatest Cities of the World with Griff Rhys Jones and also in the news & on the BBC's site last week. The site is known as the Kingsway Tunnel (a deliberately misleading name, because Kingsway is hundreds of yards away) was originally dug in 1942 as a bomb shelter for 8,000 people during World War II. The tunnels were then taken over by military authorities as a communications and intelligence centre and after the war became a place to store historic documents. They're now being put for sale by their current owner BT. According to the Associated Press - "BT spokeswoman Gemma Thomas said that the company no longer needed the tunnel because the Internet was cutting down on the need for telephone exchanges. She said restrictions on the tunnels' use meant they could not be converted into a cool new concept hotel, an underground office or a subterranean home. BT suggested they might be suitable for government use or for a major corporation. Thomas refused to reveal was BT was hoping to get from the tunnels' sale." BT are also remaining fairly cagey about how you find the tunnels. You won't find the entry door unless you know where to look. "This would be a fabulous place to open a nightclub, but health and safety laws would never permit it. Likewise, a hotel, offices or living accommodation are out. Somebody should grab the chance to use the tunnels as a film location, because they are eerie, dated and full of places to hide away from the bad guys. Although much of the kit in use there in the post-war era has been removed to museums, I saw enough relics to make it a trip back in time. There were machines bearing names of manufacturers long since wiped out by mergers and recession, such as English Electric (Stafford), Metro-Vickers, Hackbridge and Hewittic Electric, and Ruston and Hornsby. 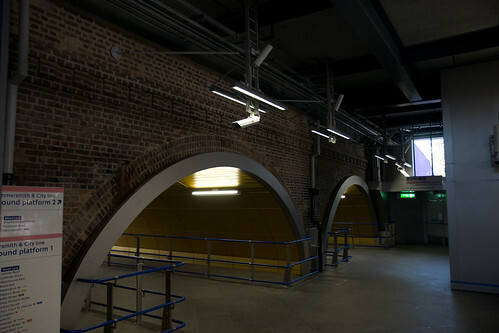 The huge tubes forming the walls of the main tunnels bear the initials LPTB, meaning they were built by the old London Passenger Transport Board." Now they are up for sale, BT are obviously trying to get some renewed interest in them again, but their secrecy was compelling for former reporters who were desperate to know what government secrets were going on down there. "In the 1980s, the investigative journalist Duncan Campbell, then of The New Statesman, did not take no for an answer. John Tasker, the former manager of the Kingsway Tunnels, said: "He had an obsession about government secrecy. He phoned BT security one Christmas and told them 'if you go down, you will find a Christmas tree'. He had planted it. They still don't know how he got down there." 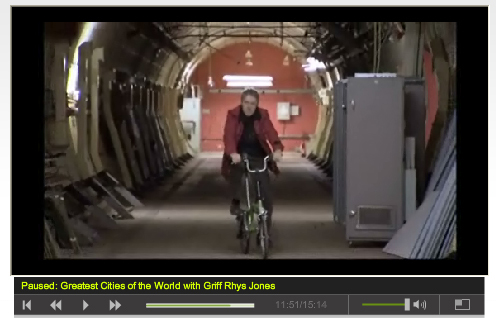 In the show Griff Rhys Jones hazards a guess as to how much the Tunnels might be going for (£5 million), but I'm sure with such limited commercial uses it'd only be in the price bracket of the mighty rich. Let's just hope that whoever buys it has an imaginative use for it & that more people get to see the eerie underground maze. 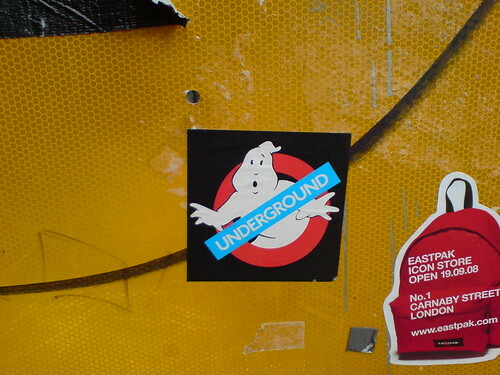 The Japanese had to go one further than the "Wake me up at XXXXX station", stickers that you might have seen on the London Underground. The stickers were for people, like me, who want to be woken up before they miss their stop. Manga artist Pyocotan has invented "Noriko-san," a sleep mask which has an electronic scrolling display fitted inside that tells fellow commuters where the wearer wants to get off. Sadly it didn't work. The theory is that other passengers will feel compelled to wake you up so they can sit in the empty seat you leave behind or just wake you up out of courtesy. In this video above, passengers probably thought he looked like a weirdo and no one woke him. Pink Tentacle said: "Pyocotan admits that Noriko-san is not 100% effective, perhaps because the unusual appearance makes other passengers feel uncomfortable and prevents them from acting. But the device will likely grow more effective as it becomes more widespread, he suggests. Until then, the fact that the mask might encourage others to act makes it a little easier for the user to relax and sleep more soundly. Noriko-san cost about 20,000 yen ($200) to develop." Thanks to Jon Justice for letting me know about this. It's a lot cheaper, but possibly not much more effective, to spend four quid on a set of "Wake Me Up at .... Stickers" and hope that someone does indeed wake you up. As the instructions above imply, the problem is getting the stickers off the sheet in the first place. I'd add to that being sober enough to write your station on them, that's if you don't live at one of the most frequently used Tube stops that are already printed on them. You also need to hope that you don't fall asleep with your head down or have long hair that covers up the sticker. 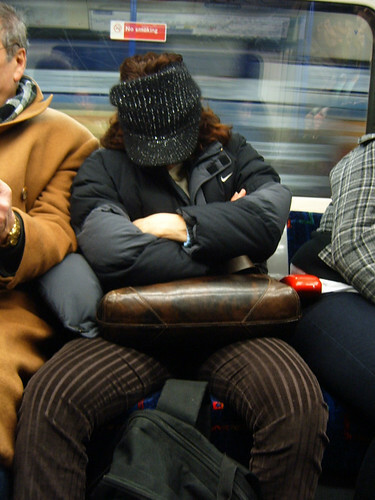 I still stupidly rely on my "luck" with the Tube fairies, who have the sense to wake me up at roughly the right time. But on a number of occasions they've really let me down badly and I've woken up near Heathrow airport too many times than I'd like to admit. I also have that 30 second confusion thing if I just about wake up right at the station I need. It takes 30 seconds to get to the side of the carriage where the doors are opening, collect my thoughts and make sure I have all my bits with me. Usually by then the doors are just closing and I'm off on another trip to Acton Town, hoping not to fall asleep yet again and end up in Hatton Cross. Any techniques which don't involve spending four hundred quid on a proto type "future boy" looking sleep mask & people's good Samritaness would be most welcome. It's Friday and time for the Tube Fashion Victims or the TFV's, commuters on the London Underground who have a unique look or have decided to go for "fashion for fashion's sake" regardless of how it looks or how practical it is for a Tube journey. This week I wanted to start with the poster of Kate Moss above. I think it's from an old Calvin Klein campaign. It's amazing how her face is revealed from the layers of posters on top. It almost looks deliberate and I couldn't stop staring at it last night. I mentioned practicality and I know that that fashion isn't always function, but I always marvel at how people managed to walk in such pointed stiletto heels. I run for Tubes quite a lot and go up and down escalators quite quickly, so simply couldn't imagine myself tottering around in those without breaking my neck. Love the colour of the boots below, but I'd be a bit cautious about those heels too. 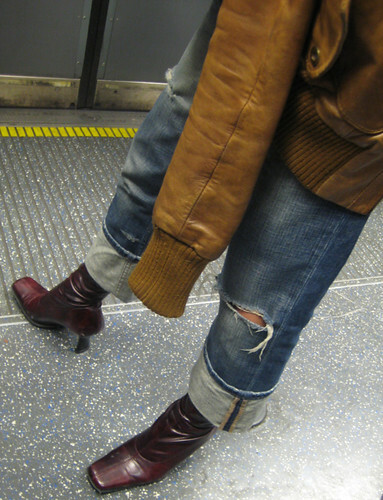 It's a shame that she went for the overdone torn jeans look with those boots. It was just a little too "hobo meets boho" for me. Oh Noes, run for the hills. Just when you thought metallic bags had gone forever they seem to be making a comeback. My eyes didn't know where to focus as the clashing metallics of the bag AND the shoes, were both fighting for attention to be the most hideous things on the carriage. 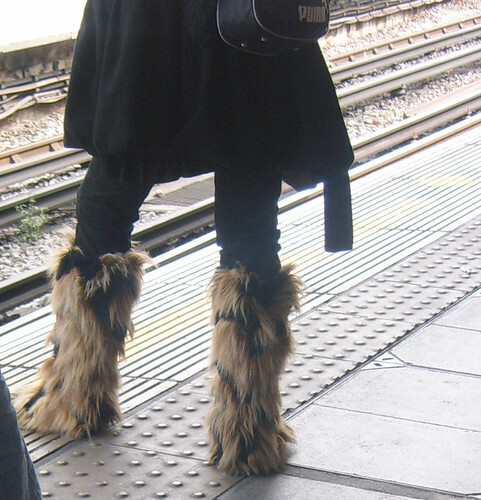 The woman below seems to have got to Old Street Tube via a trek from the Himalayas. 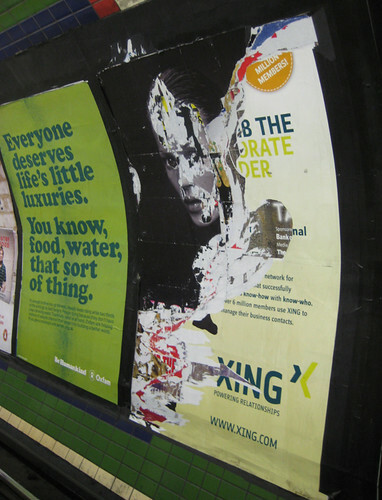 On Tuesday 21st October she will be discussing the growth of the public poster over the years and how it impacts us. "From the suffragettes to Selfridges, advertisers were exploring new ways to claim a visual identity and presence within London in the early years of the 20th century. Catherine Flood, curator at the V&A, discusses the rise of full colour pictorial posters and their sensory impact on urban space. From posters by Toulouse Lautrec and Pierre Bonnard to those by the Beggarstaffs and John Hassall, she looks at the British experience of the international 'poster craze' and explores the context of the Underground's early and progressive patronage of poster art." The hour long event starts at 6.30pm at the London Transport Museum. 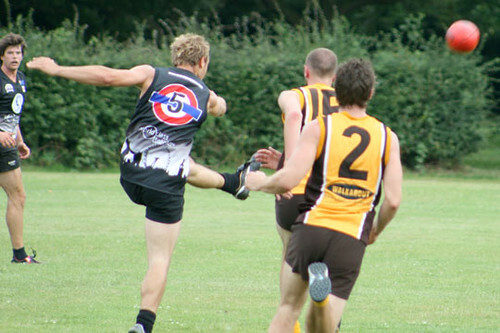 Tickets can be pre booked on 020 7565 7298 and cost £8.00 adults; £6.00 concessions; £4.00 student. I'm not sure if I can go, but the kind team at the London Transport Museum have offered us a couple of tickets. Please email me: themole AT goingunderground.net, if you'd like a ticket & I'll give them to the first to respond. 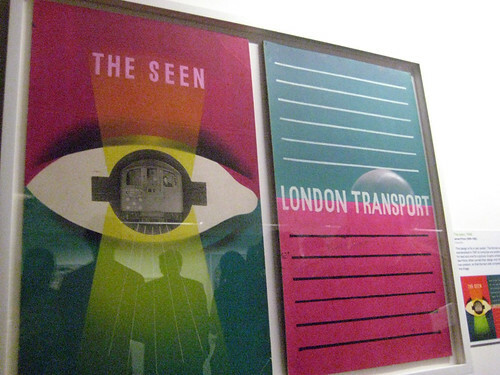 Last night I was lucky enough to be invited to a preview night of the London Transport Museum's latest exhibition which celebrates 100 years of poster art on London's public transport. 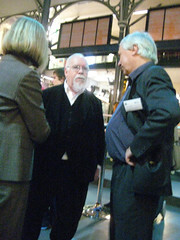 As I mentioned yesterday, it was opened by Sir Peter Blake, who looked like a pocket sized Santa behind his podium. The art gods will kill me, I'm sure, for calling Peter Blake a diminutive Father Christmas before saying he's the Godfather of Pop Art or one of our greatest British artists. 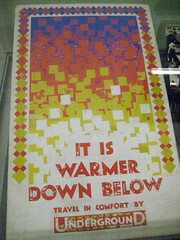 The preview night was opened by a surprisingly amusing speech from the Director of the London Transport Museum, who pointed out the irony of some London Underground posters extolling the virtues of it being warmer down below. There was also another one which wasn't at the exhibition about how it's a place to escape the summer's heat! The artists also were given the challenging brief of "By Bus to Staines", which I imagine would be difficult in anyone's books. I was quite puzzled by the first picture in the post - The Seen by James Fitton. I did quite a lot of artistic chin stroking in front of it. Apparently the 1948 poster promoted the Tube's reliability & cleanliness to help boost the post-war blues. A guy next to me, heard me saying "What's this all about then?" to Fiona from Flickr who came the exhibition with me. He tried to explain that it was all about the "seeing eye" which means that the Tube staff are all familiar and friendly with you and you'd feel safe knowing that. 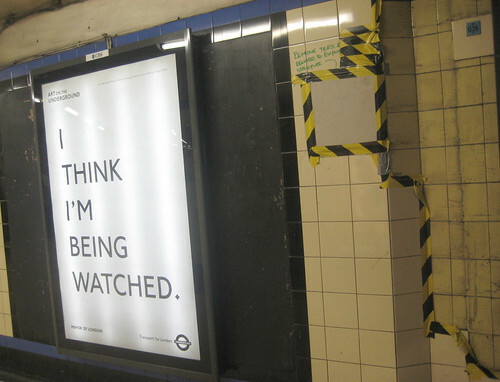 A good point for the 1940's but maybe the "seeing eye" would compare well with our CCTV / "Big Brother is watching" culture and today's Art on the Underground posters, "I think I'm being watched". Me & Fiona chatted about these graphic "font based" posters and wondered what many of the artists from the past would have thought about them. There was another poster that led to some imaginary beard stroking, which featured St Christopher, the patron saint of travellers, being zapped by some rays. 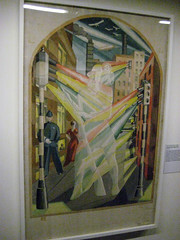 Electricity supersedes St Christopher was from 1934 and the stylised approach "reflects a trend in European art known as "cubo-futurism" based on cubist forms and dynamic movement." The artist Vladimir Poulin was chief set designer of the Russian Ballet. 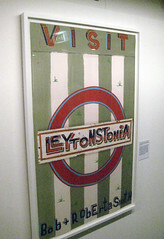 Continuing with the Russian'esque theme, we come bang up to date with Visit Leytonstonia, which was commissioned as part of the 100 Years of the Tube Roundel exhibition. This poster is by Bob & Roberta Smith who is an alumni from Goldsmiths college in London. Normally you wouldn't necessarily be hot footing it over to Leytonstone Tube Station in the East End, but it does have those fantastic Alfred Hitchcock mosaics in it. 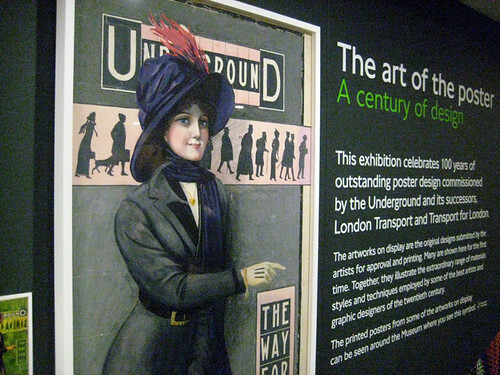 The Art of the Poster exhibition is certainly thought provoking and I'd really like to thank the team at the London Transport Museum for inviting, me, Fiona from Flickr & Jamillah from the BBC's Pods & Blogs along. I also got a chance to say hello to Ian Mansfield from Ianvisits who regularly comments on this blog. The exhibition is now open to the public and runs from 15th October 2008 to 31st March 2009. Full details are on the London Transport Musuem's website.